This blog post made me giggle from beginning to end, so I wanted to share! By the way, Barks and Blooms Dog Walkers do NONE of these things. Promise. 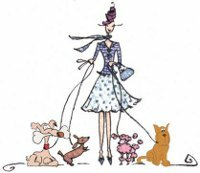 pet walkers – Belltown Dog Walker has expanded and is now serving Belltown, Capitol Hill, Queen Anne, Lower Lake Union, Downtown and surrounding neighborhoods. Hey Belltown Dog Walker! Thanks so much for the kind words! I just wandered over to your Facebook page and “liked” you. Have a wonderful day!